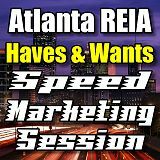 The Haves and Wants Speed Marketing Session is a new 30 minute session of the Atlanta REIA Main Monthly Meeting that starts at 6:00 PM sharp on the first Monday of the month and is hosted by Joe Thompson. The purpose of this marketing session is to help facilitate deals by giving our members the opportunity to quickly market things they HAVE and no longer want and to find things they WANT but don’t yet have. We will be video recording these session and listing the replays below for 24/7 playback to help you market your Haves & Wants throughout the month. You must be an Atlanta REIA Member to participate. Participation is first come, first serve. Show up to the meeting early (5:30 PM recommended) to get on our participant list since speaking spots are limited due to our 30 minute time limit. Bring a single flyer with big, bold letters including your Name, Phone & Email as well as your Haves and Wants. We will digitally project your flyer up on the big screen, so avoid fine print that will be difficult for the audience to read. You need to be prepared to quickly address your haves, wants and contact information since you will only have 30 seconds to one minute depending on the number of participants. Remember, you can bring business cards and additional flyers with more detailed information for display on the flyer table and for further discussion during the networking session. We reserve the right to change these procedures at any time and for any reason at our sole and absolute discretion. A special thanks goes out to Joe Thompson for hosting this session and to Alan McDonald for producing the video for this session. 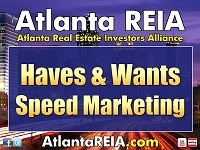 This was the Haves and Wants Speed Marketing Session that we recorded live at our March 7, 2011 Atlanta REIA Meeting. This is a new 30 minute session at our Atlanta REIA Main Monthly Meeting that starts at 6:00 PM on the 1st Monday of the month and is hosted by Joe Thompson. The purpose of this marketing session is to help facilitate deals by giving our members the opportunity to quickly market things they HAVE and no longer want and to find things they WANT but don’t yet have. Thanks to all those of you who participated. And special thanks to Joe for hosting the session and to Alan McDonald for recording the session and improving the quality of this video each and every month.